Dr. Helen Thompson is one of 21 national Broadband champions, recognised by the Australian Government. Helen’s nomination is founded on her record in advancing rural and regional economies through the uptake of broadband technologies. As the Director Centre for eResearch and Digital Innovation (CeRDI) at Federation University Australia she has extensive experience in the delivery and management of online service initiatives, research around the use of information and communication technologies (ICT), and the management of government and private funded ICT projects. The team she leads at CeRDI has specialist knowledge and expertise in interoperability of data. Projects such as Visualising Victoria’s Groundwater, Sport and Recreation Spatial website, and Barwon South West Region Fire & Emergency Stakeholder Knowledgebase are testament to Helen’s leadership. The thesis topic of the PhD Helen completed at Federation University Australia is indicative of her passion for diffusion of technology. "Reflections on effective implementation of ICT in regional and rural areas" explored two main themes – regional economic and community development, and the consequences of government-funded information and communication technology initiatives. It is not just the path of Helen’s academic and professional career that positions her as a woman of influence. She openly shares knowledge and skills with individuals, firms and communities. This passion for advancing communities and encouraging the uptake of ICT is infectious. Dr. Helen Thompson is a true DigiBiz Champion. It is not hard to work out why Mal Vallance has earned the title Digital Champion. In his role as Director of the Federation University Australia Technology Park, he works with government and private enterprise to secure investment and jobs growth in the ICT industry. He also plays a leading role in dispersing the uptake of digital technology across the Central Highlands region. The technology park is a dynamic 30 hectare precinct located 7 kilometres south of the Ballarat CBD; it employs 1400 people and generates $300 million into the Economy each year. Creating a business environment that stimulates and promotes innovation and entrepreneurship throughout the region. A large part of Mal’s career has focussed on maximising the engagement of business/industry with the University and in driving commercial oriented projects. This expertise is now being used across all aspects of work at the Technology Park. 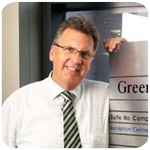 Mal Vallance advises the launch of the NBN in the Central Highlands will strengthen the position of the region. With a proven record in investment attraction, and in building professional networks in ICT, Mal Vallance will continue to advocate for uptake of broadband enabled business.